Students and community members looking for a good scare this Halloween weekend are welcome to the events that will get them in the mood for the upcoming holiday. 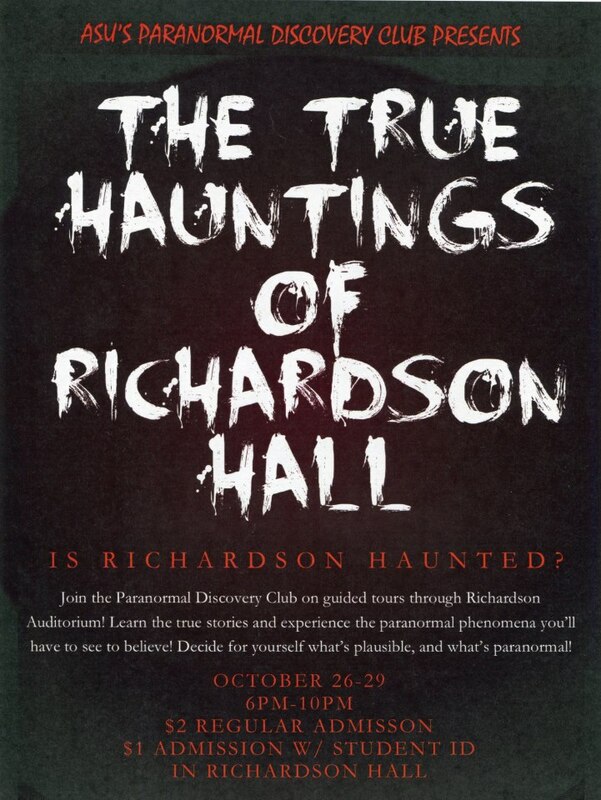 From Friday through Monday, Oct. 26 to 29 Adams State’s very own Paranormal Discovery Club will be hosting their annual True Hauntings of Richardson Hall tours. The tours will feature a ten minute guided walkthrough of Richardson Auditorium. On the tours, guests will get to hear the true stories of the deaths that have taken place on campus, and they can learn about paranormal investigating. 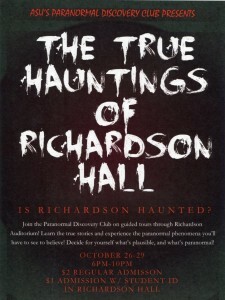 The Club will have a station set up to view the evidence they have gathered in Richardson, and their members will be talking about paranormal investigating during the wait for the tours to start. Carlos Machesta, another attendee of last year’s tours, is already looking forward to this weekend. The cost for the tours is only $2, and if students bring a valid 2012-2013 school ID, they get half-off admission. The tours will be from 6 to 10 p.m. each night in Richardson Hall. On Friday and Saturday, the Nursing Department is also hosting a haunted house on the second floor of Richardson called the Haunted Hospital. They will also be hosting a children’s carnival in room 130 of Porter Hall for parents to drop their kids off while they walk through the Haunted Hospital and the Haunted Tours. There will also be a bake sale on Friday and Saturday. Admission for the Haunted Hospital will be $5 for everyone, and there will be collaborative pricing for the Haunted Hospital and the Haunted Tours. The Haunted Hospital will run from 6 to 11 p.m.
Also, on Friday and Saturday will be another Haunted House in the Art Department. The haunted house they will be putting on runs from 8 to midnight, and admission will be $3, or $2 with a can of food. Parents are reminded that the tours and both Haunted Houses are open to children as well, but it will be at the parents discretion as to whether or not the children are allowed to enter.